Both for profit and non-profit businesses are led by ecopreneurs who are making the world a better place through their creative, innovative and ground-breaking enterprises. Lisa’s and my book, ECOpreneuring, features numerous “Ecopreneur Profiles” — including David Anderson, the founder and CEO of GreenOptions.com — along with many other brief summaries. But there are millions of ecopreneurial enterprises prospering throughout the U.S. and around the world. Perhaps you’re one, too. So, we have formed a partnership with EcoSector.com, an on-line portal serving as a unique conduit for growing the green economy, offering opportunities to share video clips, feature photographs of products or services, and display blogs. Besides EcoSector.com’s search function, find possible funding support, announce new products or services, or inspire other ecopreneurs. 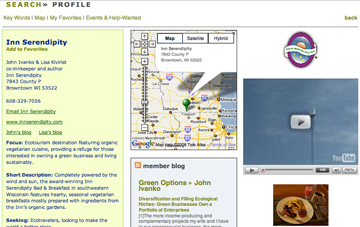 It’s a dynamic ecopreneuring portal that incorporates ideas from those business owners who use it. Perhaps best of all, is completely free to use. Submit your own ecopreneur profile on EcoSector.com and connect with other enterprising ecopreneurs who are changing the world for the better through the businesses they create. There is no fee to join the EcoSector.com portal. For some ecopreneurs, it might even bring the needed capital to get their enterprise off the ground or develop it further. We look forward to learning more about your green business or enterprise.